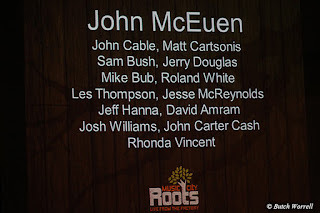 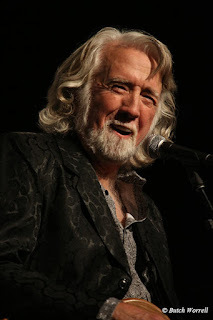 I was privileged to attend and photograph John McCuen's 70th birthday party show held at Music City Roots. Normally I would write my own review but Craig Havighurst's from his Roots blog was so good that I asked for and received permission to reprint it below. 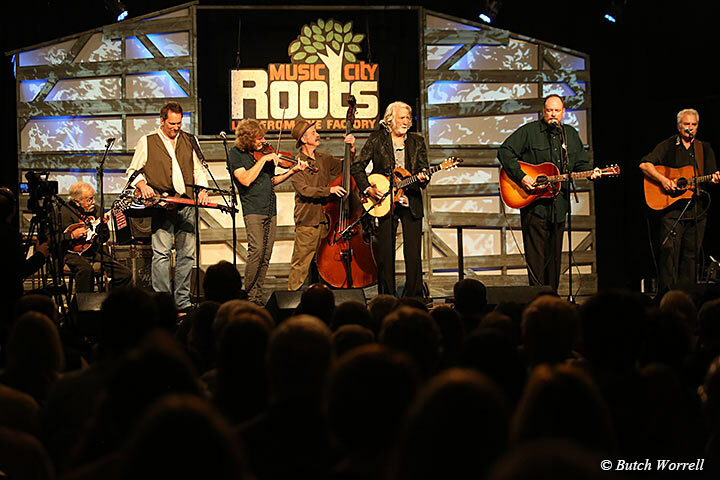 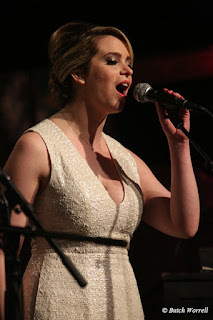 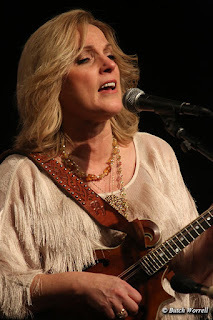 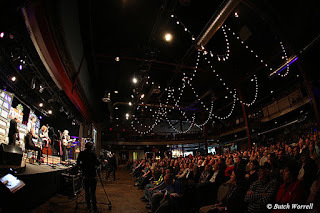 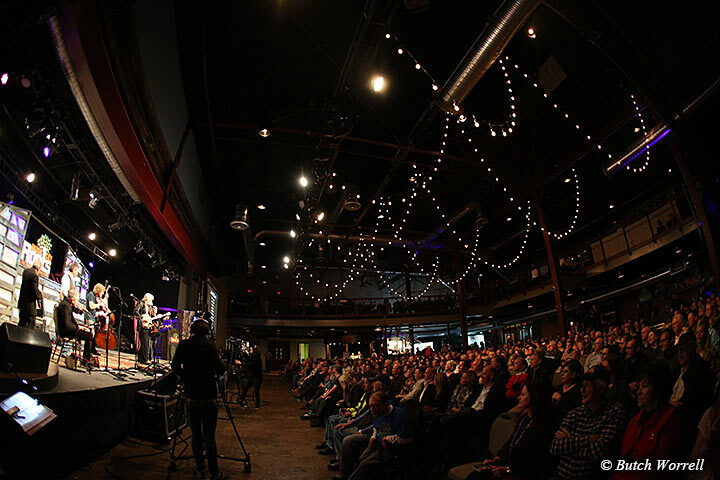 There is a link to the original Music City Roots blog which I encourage all to check out now and for future shows. 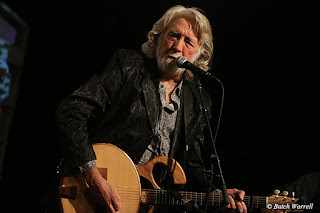 In my show preview I compared John McEuen to Gandalf the wizard, but given the momentous events of this weekend, it might be more apt to think of him as Obi Wan Kenobi. 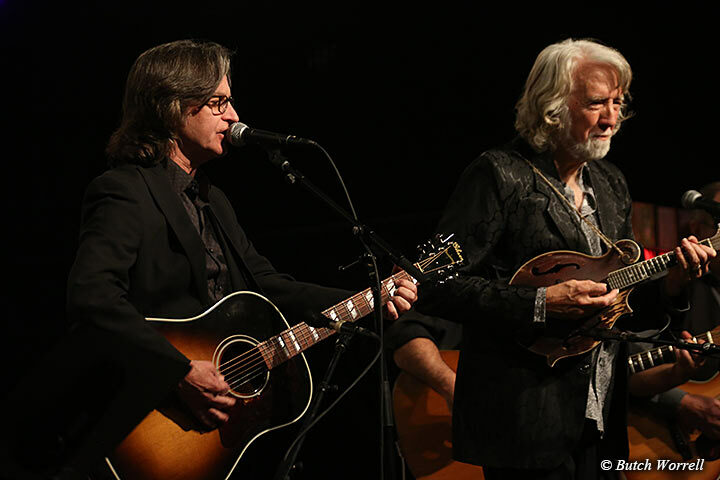 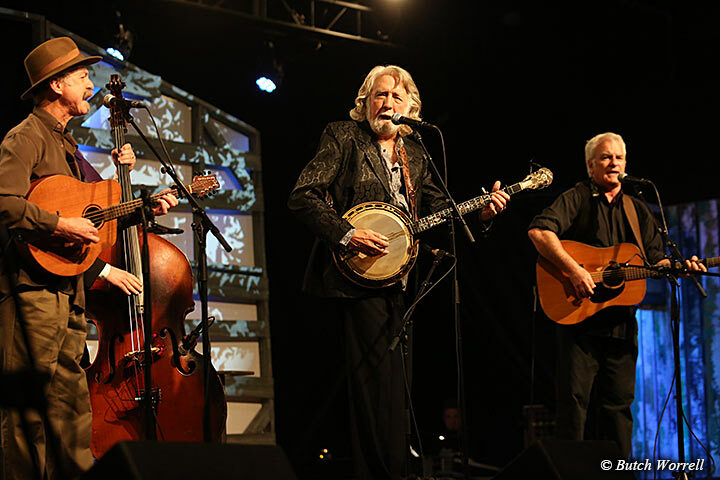 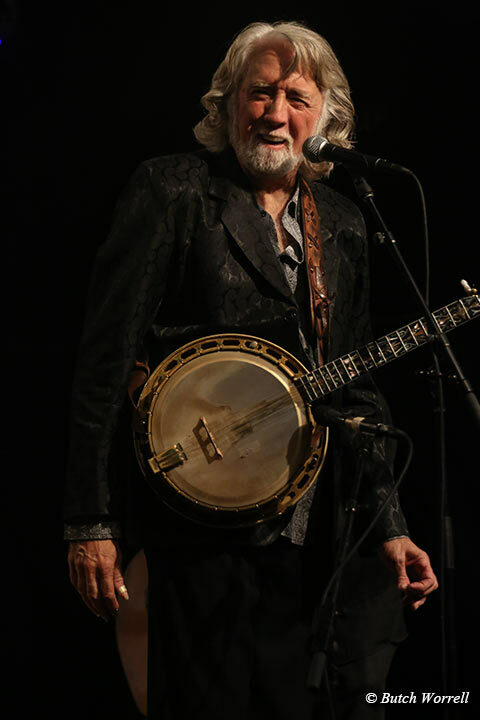 For John McEuen is indeed a Jedi master of the banjo and guitar. I’ve seen him captivate 2,000 people by himself on stage at the Ryman Auditorium. 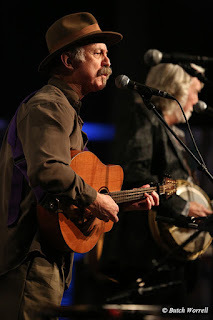 Last night his old friend Bernie Leadon said in the chat room that McEuen on clawhammer banjo is so compelling he can levitate an X-Wing Fighter out of a swamp. 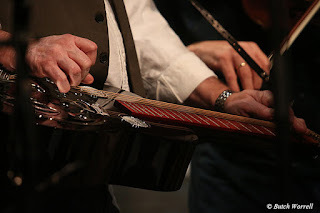 Or words to that effect. 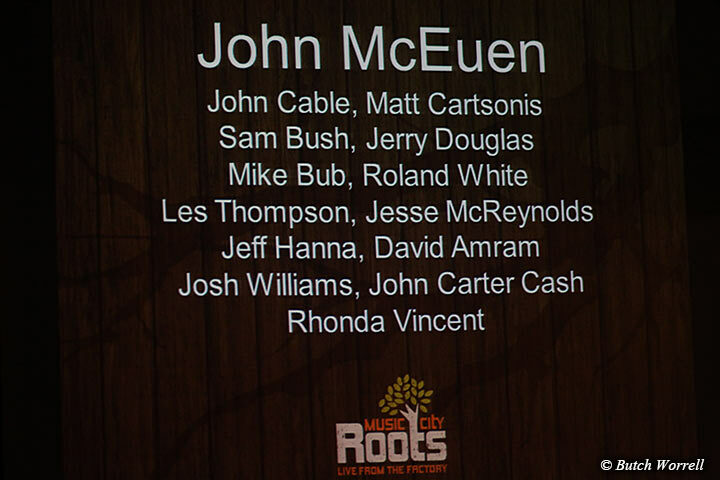 McEuen has been, no doubt, a force, and his 70th birthday blowout at Roots was magnificent and moving. We had many stars, but no wars. 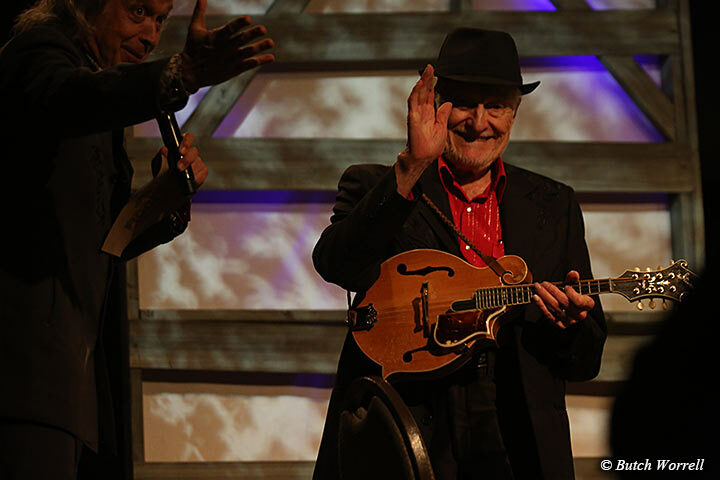 And a lot of love flowed for a great musician who’s made the galaxy a better place. 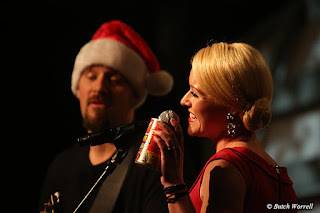 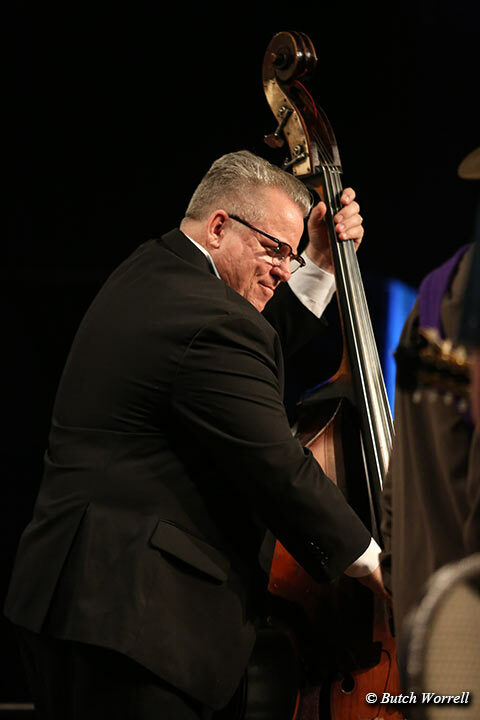 The scene was set with sweet walk-in music from the Music City Strings, blending Christmas, classical and Americana fare. 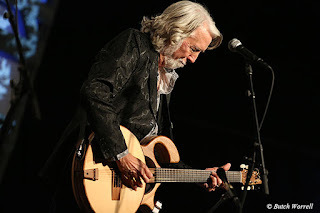 Jim Lauderdale wore one of his Manuel suits (apparently conjuring Manuel himself, whom I saw back stage) and got things underway. 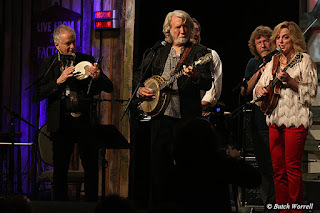 McEuen took the stage for a solo tune of his own, fingerpicking his exotic looking acoustic/electric guitar on the Merle Travis standard “Walking The Strings.” Then the parade of guests began. 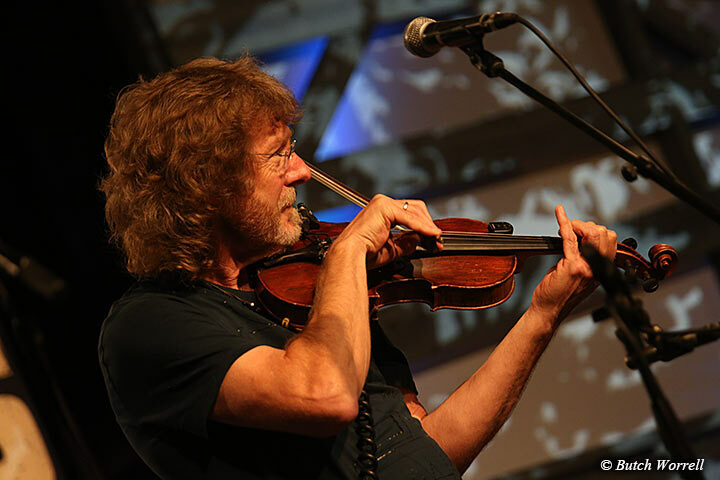 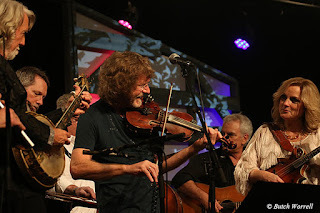 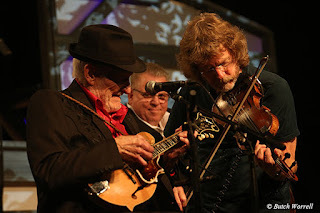 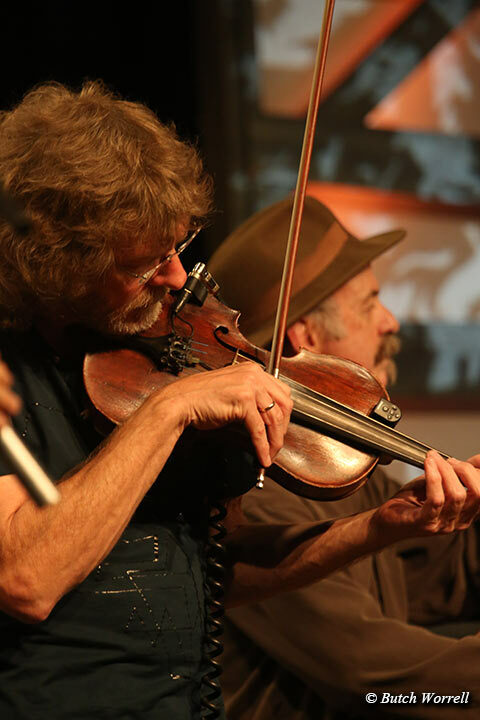 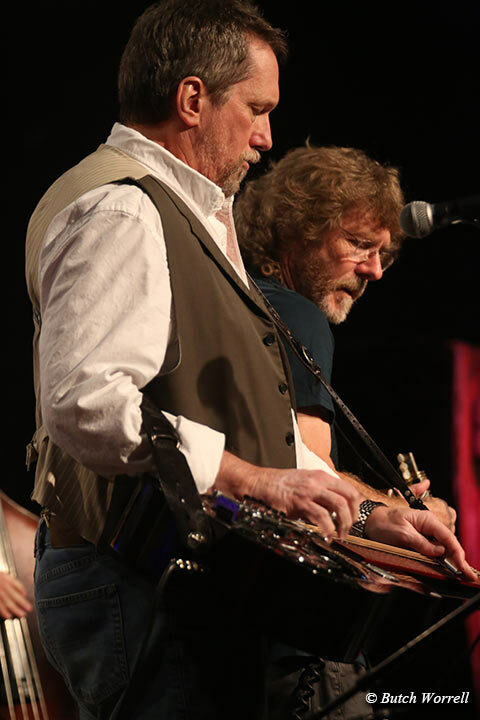 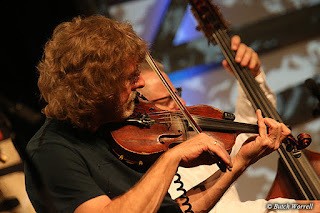 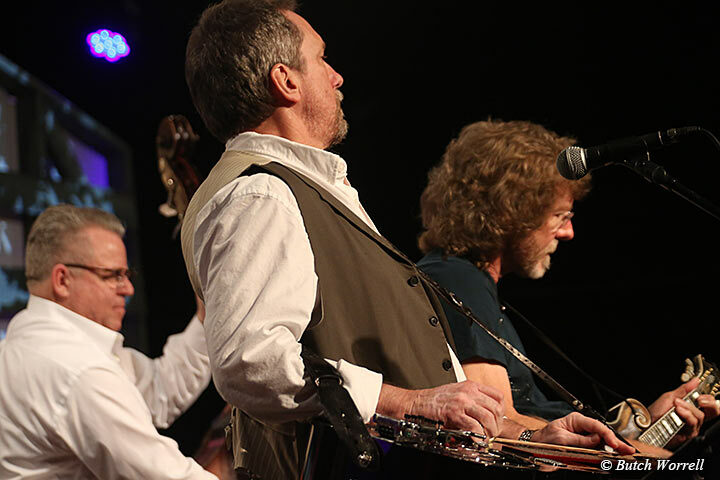 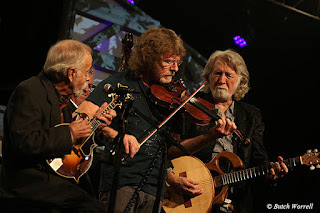 Sam Bush and Matt Cartsonis (an old McEuen friend) joined on fiddle and mandolin for a sweet bluesy “I’m A Pilgrim.” Matt sang a nice lead on the bluegrass favorite “Blue Ridge Mountain Home” with Roland White playing his fluid mandolin opposite him on stage. 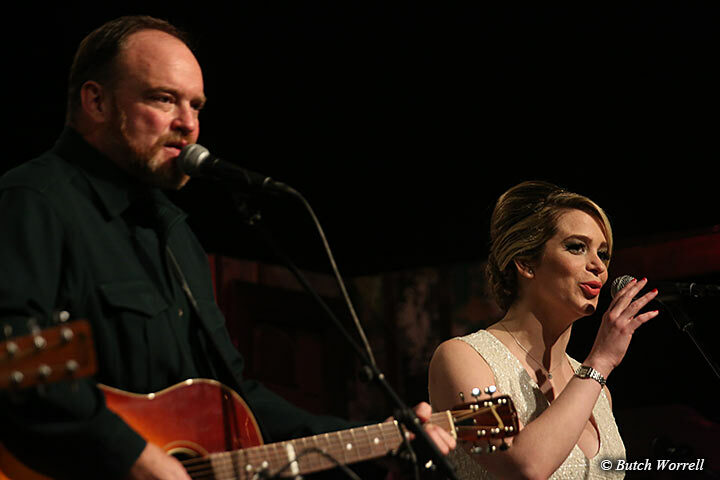 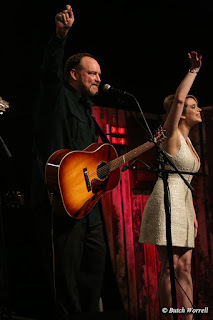 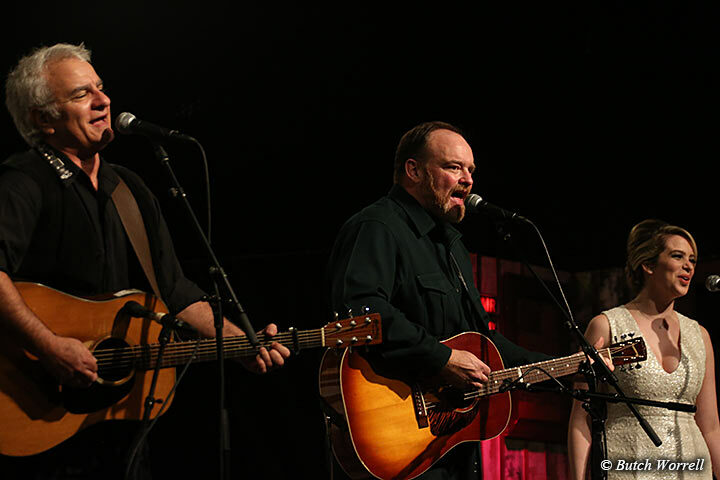 Everything ramped up to John Carter Cash taking the stage to personally evoke the first family of American music with songs by the women of the lineage, Maybelle Carter and June Carter Cash. 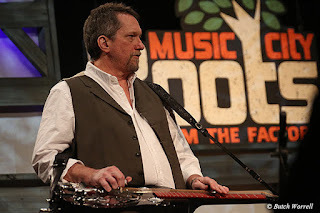 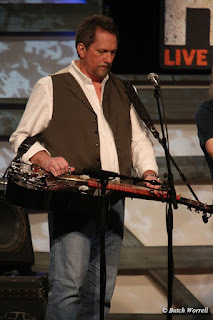 The dancing dobro lines by Jerry Douglas answering the vocals on “You Are My Flower” were delightful. 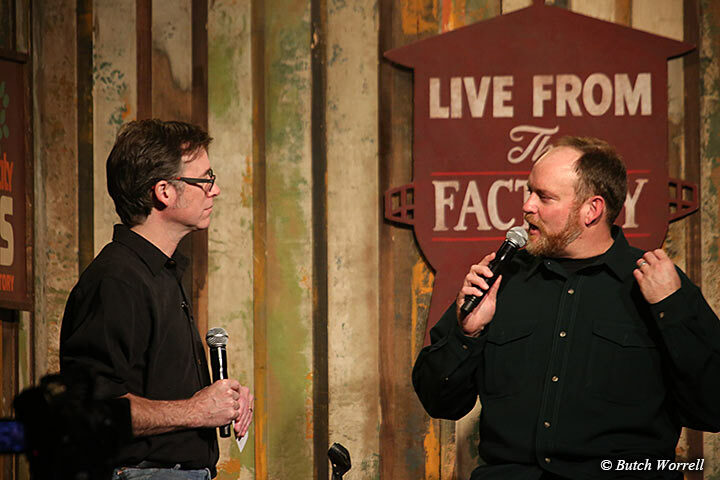 Then between sets I got to interview Mr. Cash and that’s always a grounding, humbling experience. 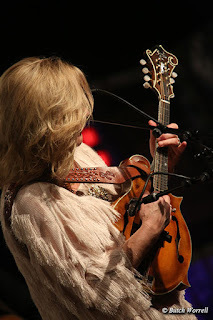 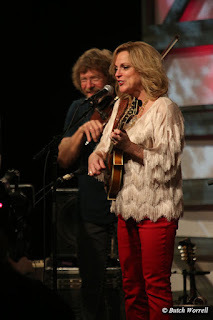 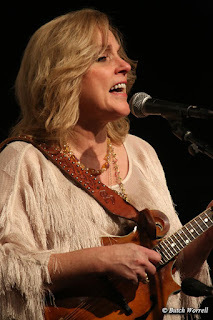 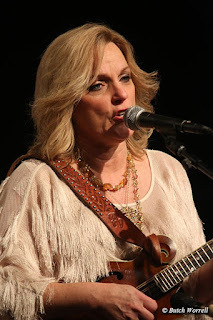 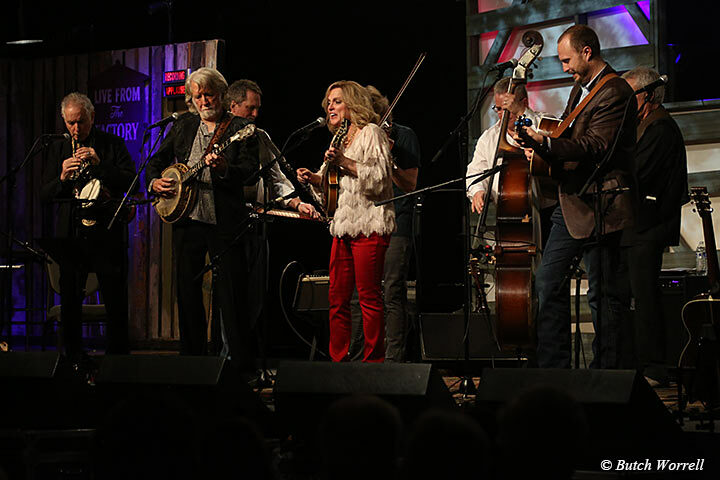 Rhonda Vincent made her way to the stage to kick off Set II with a hot mando solo on “Little Girl of Mine From Tennessee” while our bass playing buddy Mike Bub took lead vocals. 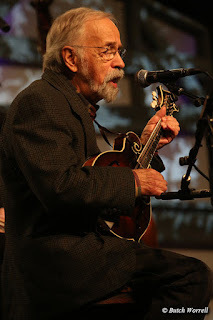 Roland White enjoyed the support of a large backing band as he sang the venerable “Christmas Time’s A Comin,” about as cheerful a number as there is, despite having come from Bill Monroe, who was nobody’s idea of Father Christmas. 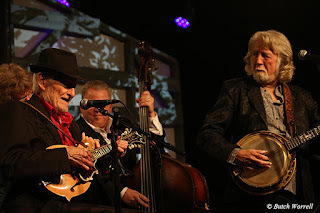 McEuen conjured the spirit of Doc Watson (it was a night of nodding to influences and heroes after all) with a brisk “Way Downtown.” And then the segment concluded with two performances by Jesse McReynolds, who comes off like the world’s coolest grandpa. 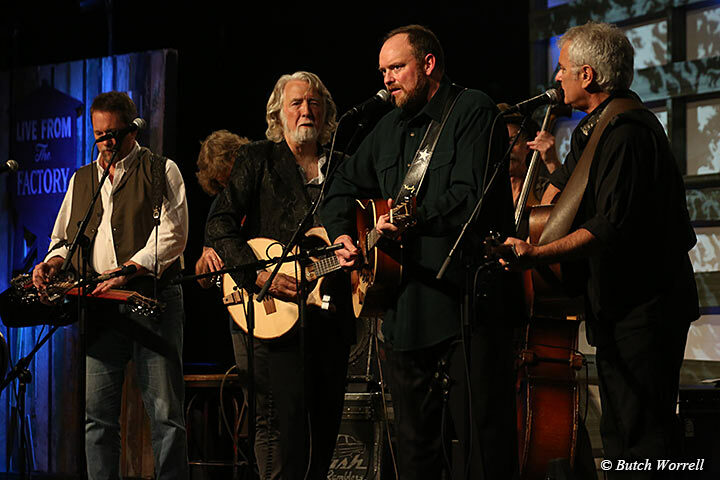 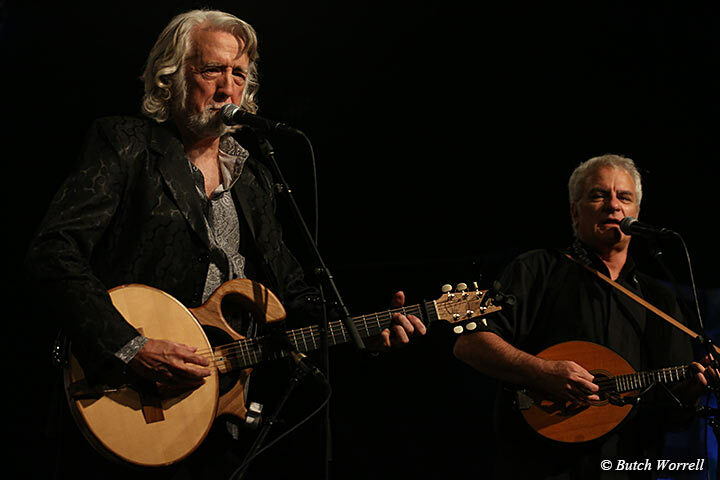 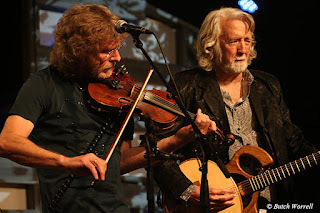 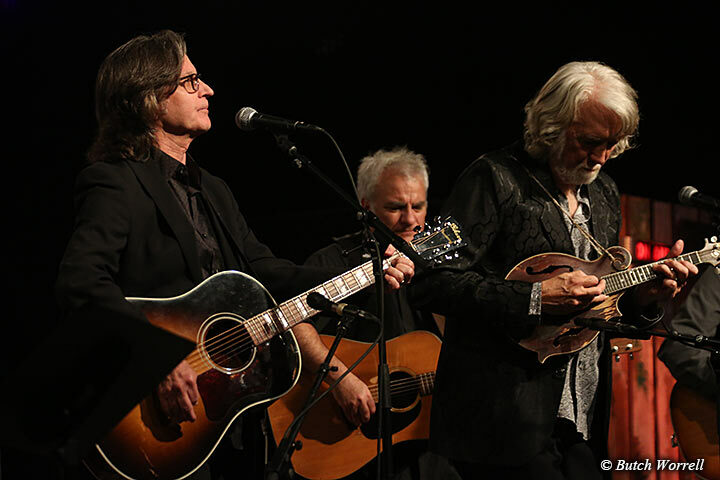 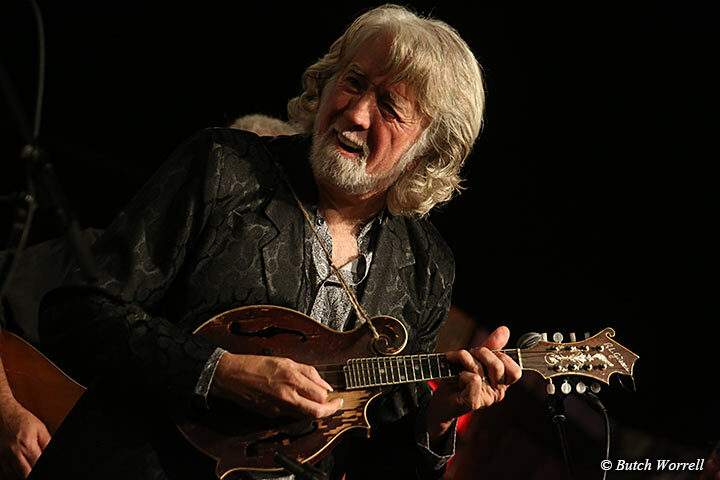 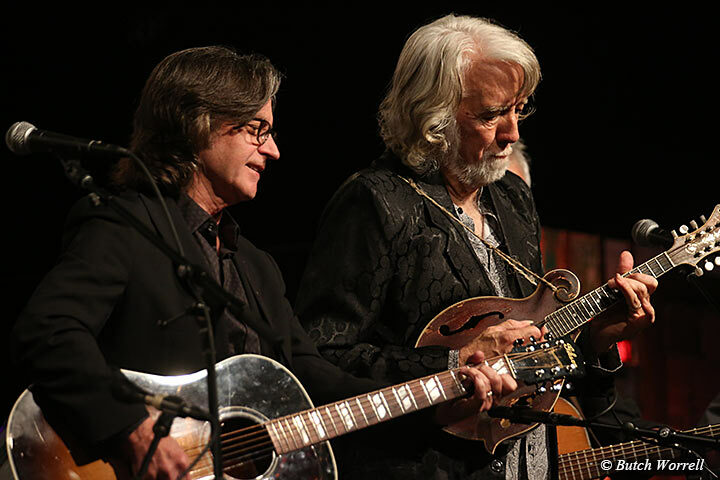 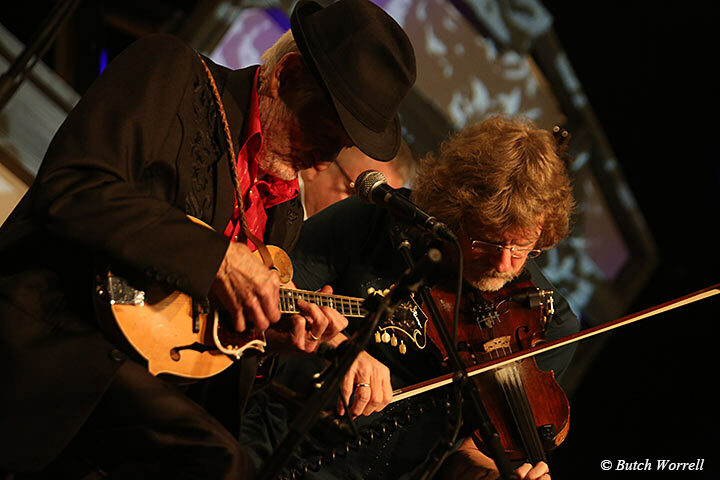 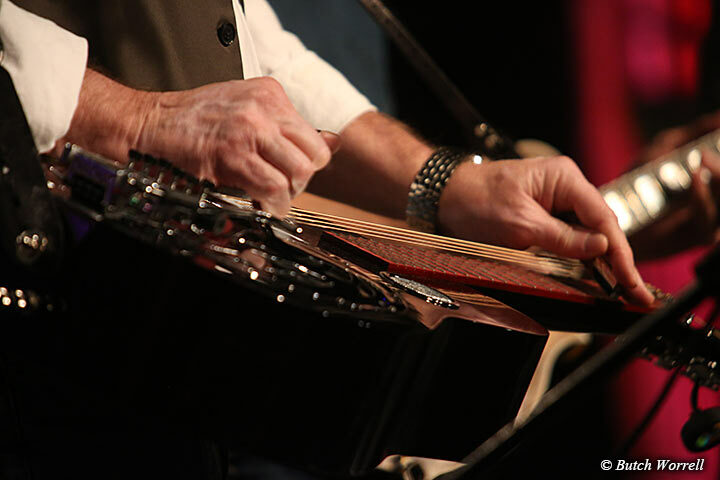 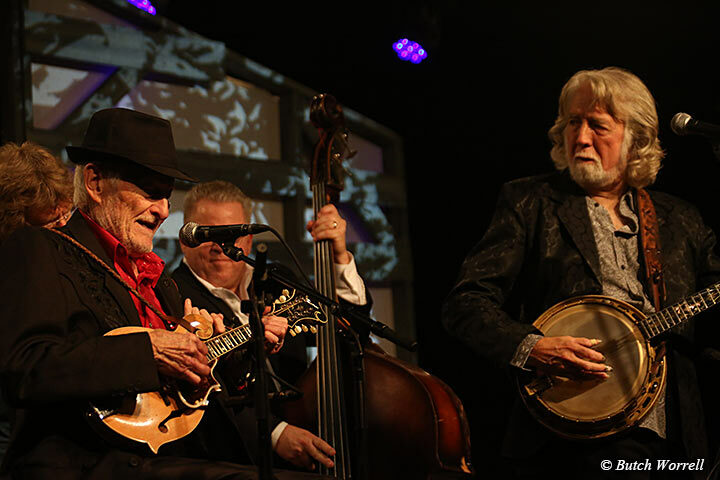 McEuen, who offered up just the right amount and kind of witty stage commentary and stories all night, recalled the direct inspiration of Jesse’s mandolin style on the recording of “Mr. 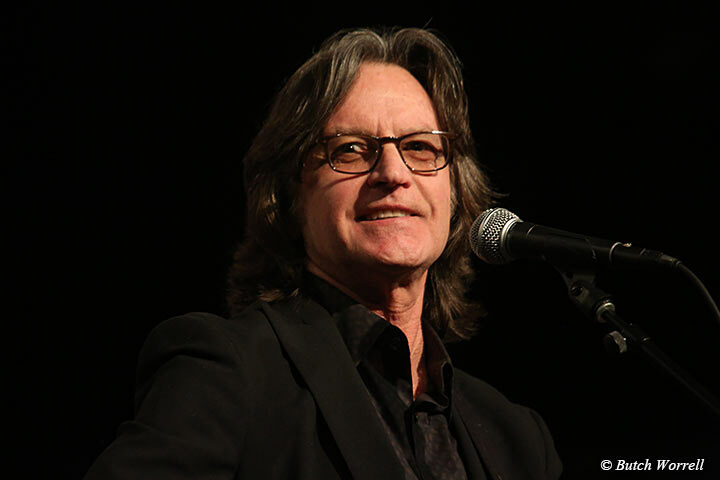 Bojangles,” a Nitty Gritty Dirt Band hit that was waiting in the wings. 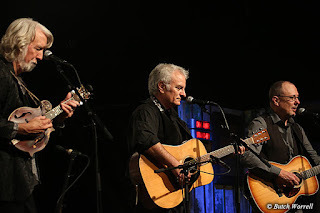 It would arrive in segment three which featured Dirt Band veteran Jeff Hanna singing two of the group’s most beloved songs. 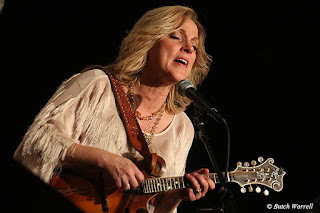 “Some of Shelly’s Blues” has one of the greatest melodies in all of country rock. 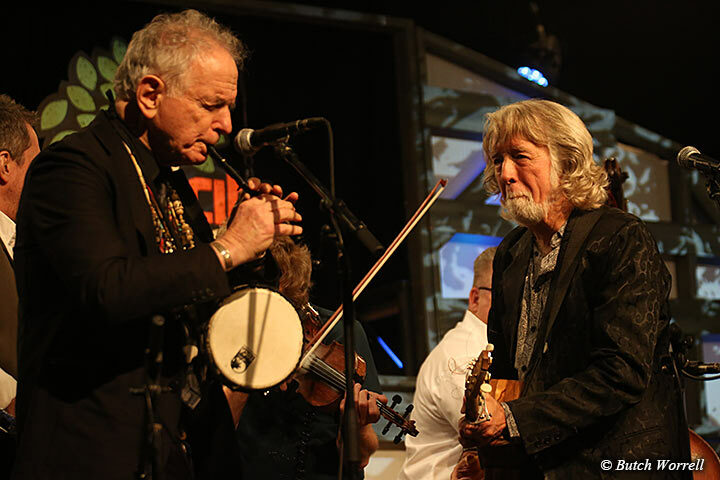 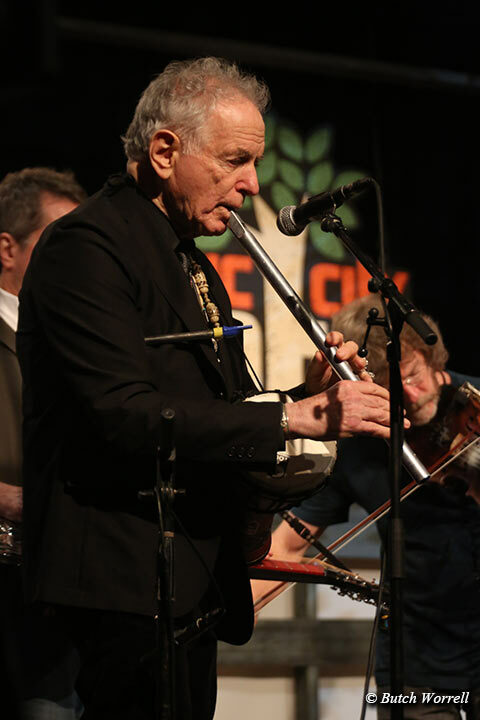 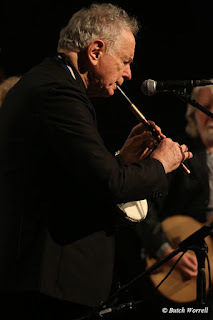 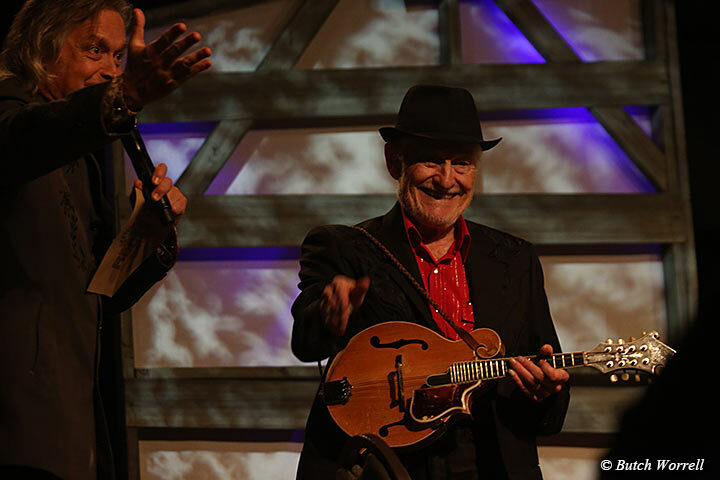 Sam laid some tasty fiddle into its mellifluous flow and David Amram, a curious character over on stage right for much of the night, played one of his tasty Celtic whistle solos. Then Jeff told the story of a tricky guitar lick to kick off “Bojangles,” which made me cry and made the audience leap to its feet for a roaring standing O that could have been the end of the show. 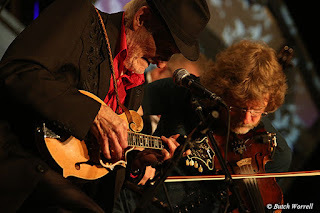 But there was much more to come. 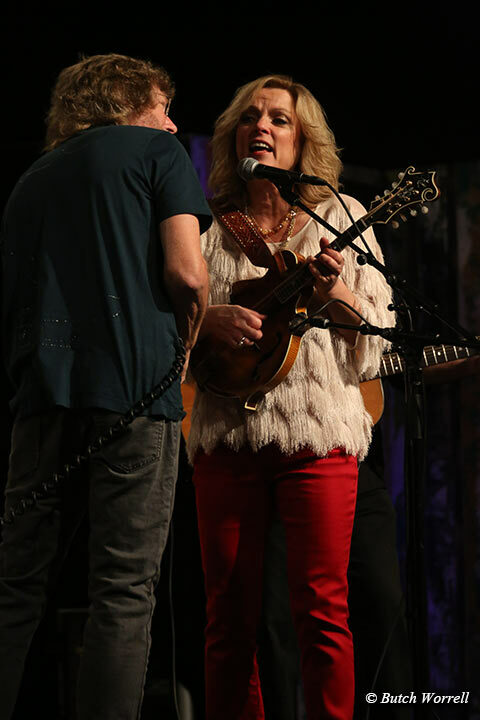 After a fiery newgrass romp on “Dismal Swamp,” Rhonda returned for more Christmas cheer, including guitarist Josh Williams picking hot on “Jingle Bells.” A Sam and Jerry heavy bluegrass instrumental of “Earl’s Breakdown” closed the set, with McEuen honoring one of his heroes with excellent Scruggs style picking on a gorgeous inlaid banjo. The final set featured a bit more instrumental picking, some moody and some speedy and breezy. Matt Cartsonis gave up on a mandolin solo that was rolling at a few too many beats per minute and closed out a chorus of “Wile Ride” with a face solo unlike any we’ve seen since the Riders In The Sky. 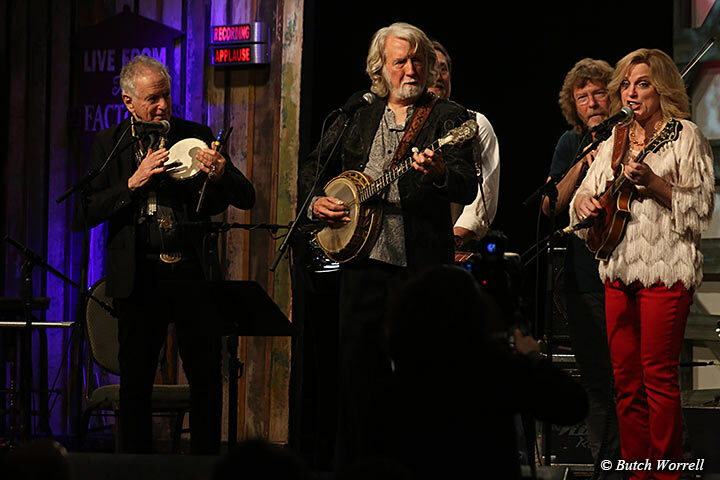 But we all knew what we were waiting for, and that was a full-throated, all-hands version of “Will The Circle Be Unbroken.” I liked the choice to NOT do that as the final Nashville Jam because that’s how it’s always deployed. Instead it was a benediction to the show itself, and the way was cleared room for a proper blues jam on “Okie Boogie” that featured mind-bending instrumental power and finesse from everyone. 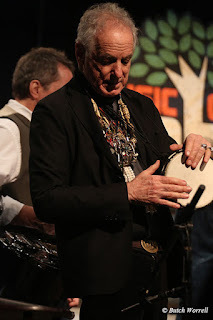 And with that another year comes to a close in just the way one hopes – a circle of love and mutual respect. 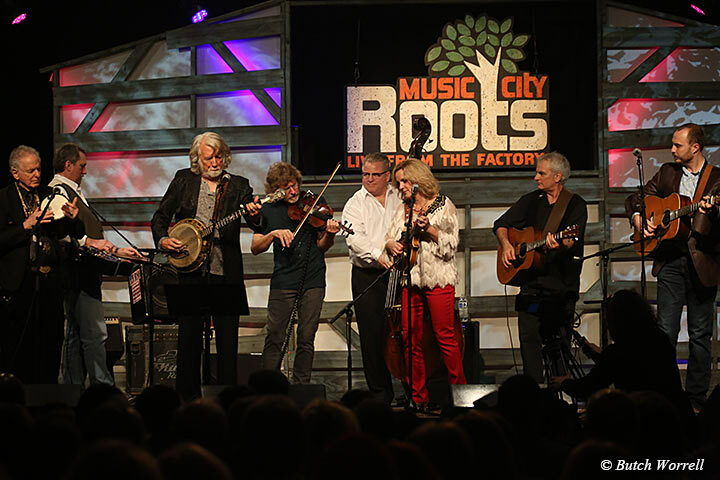 We take two weeks off now, and all of us at Roots wish you a happy season and a bright new year. I can’t wait to compare notes on Star Wars when we meet again. You remember Obi Wan Kenobi’s speech about The Force, don’t you? “It surrounds us and penetrates us. It binds the galaxy together.” Sounds a lot like music.